Is Green Pineapple from Costa Rica Ripe? There is a common misconception that green pineapple is not ripe yet, however, pineapple doesn’t have to be yellow to be eaten and enjoyed. Caribbean pineapple is ripe and available year-round, but is green at certain times of the year. Pineapple can be completely green outside but completely ripe inside. 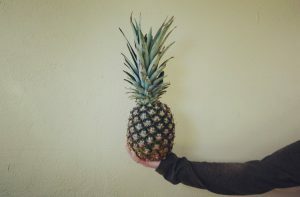 This is always hard to accept because we have a tendency to believe that all fruit will continue to ripen after harvest, as a high percentage of the fruit that we generally eat are climacteric and do continue to do so, but not pineapples. When the pineapple is picked from the plant, it is already ripe and will not ripen more when transported or taken home. Fully ripe pineapple means that the pineapple has reached its full sugar content, which also means it’s more prone to bruising and rotting. When exported, pineapple has to be shipped overseas, so if the pineapple isn’t picked until it’s fully yellow, it will likely rot or bruise along the way. Due to this we pick pineapples at just the right time, when sugar content is full and sweet to be enjoyed, but the fruit will be transported safely. We test our pineapple in house to ensure the sugar level is optimum before shipping. Pineapple production and export has grown significantly over the past 15 years. It has been recorded that between 2001 and now there has been an increase of at least 175 million boxes of pineapples being exported. People are enjoy pineapples green and golden around the world daily. This entry was posted in Featured, Latest News, Tips & Tall Tales. Bookmark the permalink.